The global port terminal operator DP World has bought a shipping line. 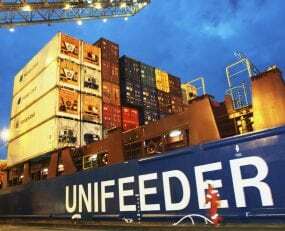 The Dubai-based terminal operator announced yesterday that it has taken control of Unifeeder Group, a Danish shipping company specialising in the provision of ‘feeder’ services, shipping containers between larger and smaller ports in Europe. Unifeeder’s enterprise value is estimated by DP World to be €660m, however it is unclear what the mix of debt and equity is. Bearing in mind that this company is described as “asset light” by DP World, it is to be assumed that the company’s ships are all chartered. Unifeeder’s fleet comprises 56 vessels with an estimated capacity of over 40,000 TEUs. Unifeeder was bought from the private equity company Nordic Capital. DP World state that Unifeeder had revenues of €510m in 2017 with “EBIT margins in line with other asset-light logistics operators.” This would suggest a percentage in the mid-single digits, which would be respectable for a container feeder operator. It is worth noting however that DP World described Unifeeder as “cash generative and operates on a highly flexible cost base”. The market for this sort of service is tough, with the dominant clients being large deep-sea container lines. So why would DP World buy Unifeeder? It appears to be another step in its strategy of improving margins through investment in services beyond container terminal operation. Last year it bought warehousing operations in India and South America for several hundred million dollars. While the warehousing market in emerging markets market is often highly attractive, this is something that cannot normally be said for container feeders in Europe. Presumably DP World are hoping to offer better integrated services to clients, leveraging economies of scale and knowledge of operations. It is also possibly seeking to offer services that bypass increasing landside congestion around major ports. Delivering on this will require good information management. Although the business model of Unifeeder appears flexible, previous experience suggests this type of vertical integration can be hard to make work.